It's easy to use the VL53L0X sensor with Python and CircuitPython, and the Adafruit CircuitPython VL53L0X module. 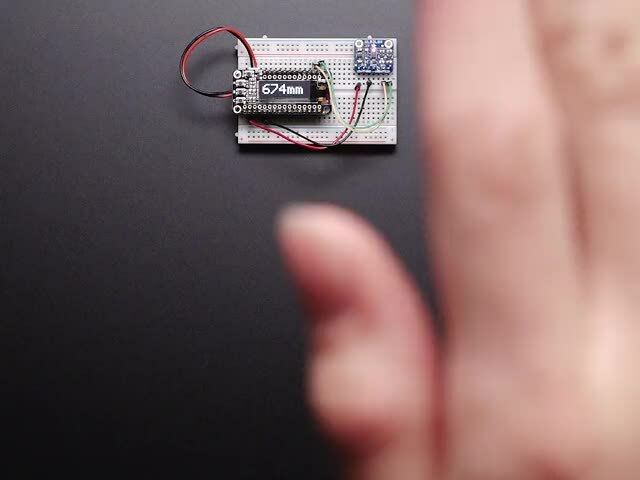 This module allows you to easily write Python code that reads the range from the sensor. You'll need to install the Adafruit CircuitPython VL53L0X library on your CircuitPython board. You can also download the adafruit_vl53l0x.mpy from its releases page on Github. Before continuing make sure your board's lib folder or root filesystem has the adafruit_vl53l0x.mpy, and adafruit_bus_device files and folders copied over. To demonstrate the usage of the sensor we'll initialize it and read the range and more from the board's Python REPL. range - The distance in millimeter to an object in front of the sensor. See the simpletest.py example for a complete demo of printing the range every second. Save this as code.py on the board and examine the REPL output to see the range printed every second. That's all there is to using the VL53L0X with CircuitPython! # Simple demo of the VL53L0X distance sensor. # Will print the sensed range/distance every second. # Initialize I2C bus and sensor. # Optionally adjust the measurement timing budget to change speed and accuracy. # The default timing budget is 33ms, a good compromise of speed and accuracy. # Main loop will read the range and print it every second. This guide was first published on Nov 23, 2016. It was last updated on Nov 23, 2016. This page (Python & CircuitPython) was last updated on Apr 23, 2019.